For KOO de Monde, we designed a display ad for the back cover of the Boston Design Center’s Cybele magazine. The design harmonizes with their identity as presented on their web site. 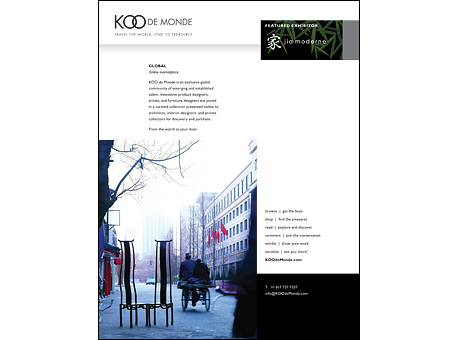 KOO de Monde is an online marketplace for interior designers, architects, and private collectors. It features the specially selected works of established and emerging artisans from all over the world.